Bulk Powders members automatically get access to our loyalty rewards program. We designed it as a thank-you, to save you even more money every time you shop with us. Start accumulating loyalty rewards immediately! Simply register your details and sign in. In fact, we reward new members straight away (just for signing up). From then on, it just gets better: you'll be rewarded for your loyalty each and every time you shop online with us or when you interact with us online and when you refer us to your friends. Our members qualify for an automatic 1%* rebate from the base value of any product purchased online at Bulk Powders Australia. Rebates can be redeemed as store credit (we call it BP$). There are a heap of ways to gain bonus BP$. The more you interact with us online, the more we reward you. Let's just say you're so impressed with one of our products, you decide to write a review about it: we reward that with BP$. If you're wondering “how else can I earn BP$?” try referring your friends via our referral program and reap ongoing BP Referral Dollars! Want to know more or have a few questions, check out the FAQs. Share the love and earn extra BP$. 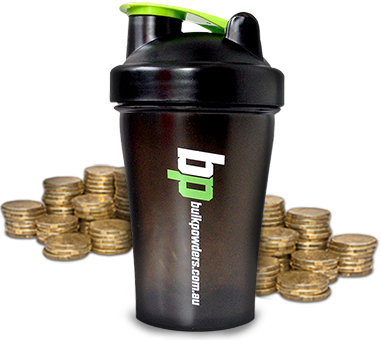 Introduce your friends, family, training partners and team mates to one of Australia’s best online sports nutritional and supplement stores and start earning extra BP$. For every new purchasing customer you refer, you earn additional BP$. And the rewards just keep piling up: you won’t just earn BP$ on their first purchase, you’ll continue to earn them each and every time your referral makes purchases. When your newly referred customer clicks through on your link or uses your unique code on sign up, you’ll not only be introducing them to one of Australia’s best online sports nutritional and supplement labels. You'll be helping them save cash. They can receive up to $10.00-worth in BP$, ideal for helping them kick start their supplement shopping. In return for sending us a new customer, we’ll reward your account with bonus BP$ to the value of 3%* of your referral’s first purchase. But it doesn't stop there...! Every time your referral shops online with us, we’ll boost your account with bonus BP$ to the value of 1%* for every purchase your referral makes. There's no limit to this, and the rewards will keep on coming for as long as they shop with us. Want to know more or have a few questions, check out the FAQs.